A guild friend of my invited me to join her in making a block for Squares of Hope for the banner that JP Knit & Stitch is creating. The banner will be used in Jamaica Plain's annual "Wake up the Earth" celebration event which will be on May 6th this year. On one side of the JP Knit & Stitch banner the squares will be knit, crocheted or woven and the opposite side the block will be fabric--either a quilt block or an embroidery block. Each square should be 6 inches finished (fabric squares should be trimmed to measure 6 1/2 inches to allow for seams). The block should "reflect a community value you wish to champion including (but certainly not limited to) environmental protection, arts education, social justice, and human rights." It's fine if they are abstract. I chose environmental protection. 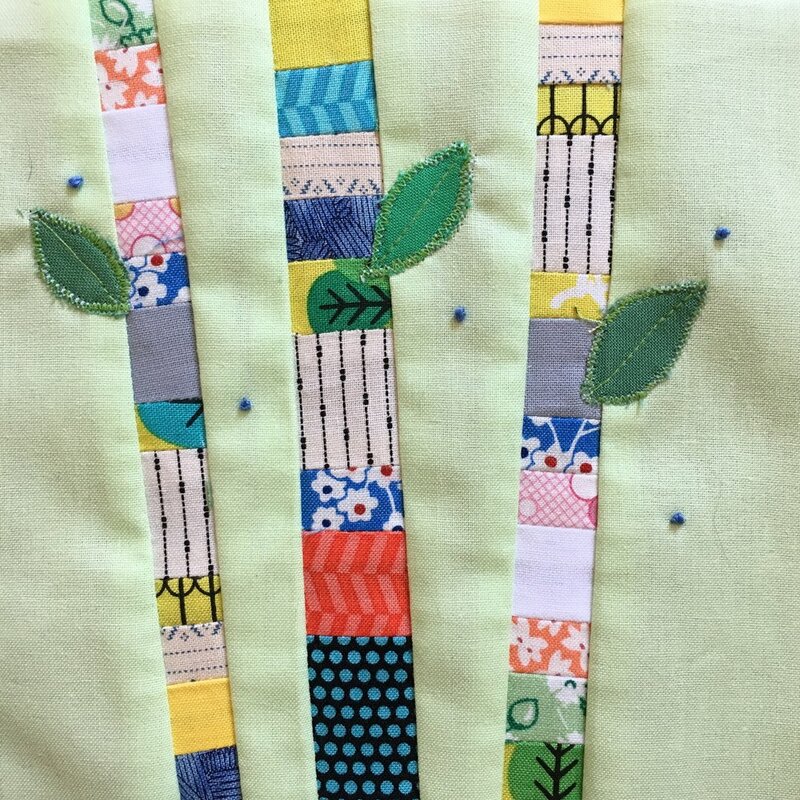 Amanda Jean Nyberg (crazymomquilts) has a quilt pattern, Bright Birch Trees, that I thought would make perfect block. Since this is Spring, I added appliqued leaves and embroidered French knots to her design. It's a fun block to make! Then I got an idea about a polar bear block. When I was a kid, I'd often try standing on a kick board in the pool. It didn't have enough buoyancy to keep me on the surface, so I'd sink. So in my square above, poor Polar Bear is standing on a melting ice floe that isn't large enough keep him on the surface of the rising sea. Sad--and true. JP Knit & Stitch is hosting Stitch Nights at their shop on April 21, 28 and May 5th for folks to work on these blocks. If you are sewing at home, they've asked to have blocks dropped off by April 29th since they need to sew them together! Click the link above for all the details about making the squares, sewing days and the May 6th event. Boston people: Do you have an idea for your own Square of Hope? Join in the fun! Post your block on social media using #WUTECraftactivism. Happy Crafting!